I've always adored cantaloupe. It was the melon toward which I veered, from a young age. And I've never tired of it. As I've gone from the messy gobbling of freshly-sliced cantaloupe passed to me from my father's deft hands, to the more sophisticated pairing of the melon with salty, unctuous prosciutto at countless outdoor cafes all over the Italian peninsula, my love affair with the orange melon has not faded. So imagine my surprise when I started researching the cantaloupe, and found that the etymology of cantaloupe comes from the Italian word cantalupo, taking the name of the town Cantalupo in Sabina, a former papal seat outside of Rome in the province of Rieti, where the melon was supposedly first popularized in the west, grown in the papal gardens in the 15th and 16th centuries. The melon most likely originated in South Asia or Africa, and was introduced to Italy via Armenia. But most importantly for my personal connection to cantaloupe, the town of Cantalupo in Sabina is quite close to the town of Torri in Sabina where my dear friends live, and where I've spent a lot of wonderful weekends relaxing and cooking in the countryside near Rome. I dare say we've indulged in plenty a plate of prosciutto e melone in the area of this melon's namesake! Cantaloupes are members of a family of vegetables and fruits that includes cucumbers, squashes, pumpkins, and gourds, called the cucurbit family.This family also includes lots of types of melons, including crenshaw, casaba, Persian, canary, and watermelon. 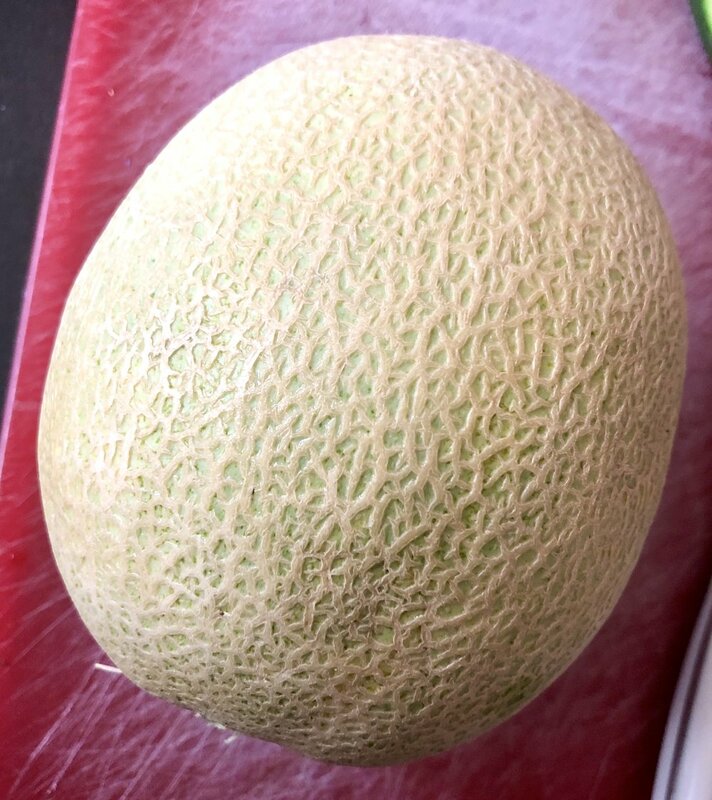 The European cantaloupe's outer skin is gray-green and is lightly ribbed (like a basketball), whereas the North American cantaloupe has that familiar net-like skin covering, with a light grey rind. Of all of the cantaloupe's nutritional elements, it is highest in vitamin A/beta carotenes and vitamin C. It also contains a variety of antioxidants and anti-inflammatory phytonutrients, among which are the flavonoid luteolin. The melon is also rich in potassium, fiber, folate, magnesium, and vitamin K.
Perhaps most interesting and potentially promising about cantaloupe's nutritional benefits is its capacity to prevent metabolic syndrome, presently in research studies with humans. This could translate to health benefits as relates to heart health, since many heart issues are initiated by inflammation and oxidative stress. It is also thought that cantaloupe consumption can help improve blood sugar metabolism and insulin resistance in humans the way it has in animals. The cantaloupe didn't become a commercial crop in the United States until the very end of the 19th century, but now it's available everywhere in the summer -- though in my opinion, it's best purchased from a local farm stand where you can smell the musky scent of ripe melons that have been sitting in the summer sun. The best way to consume a cantaloupe? Whichever way you like it best, of course. But besides the joy of eating it in slices out of hand, or halving it and filling the scooped-out center with berries and eating it with a spoon (both classic modes that will always be delicious)...I've started to use the melon in savory preparations too. If you pair it with another member of the cucurbit family, toss in some fresh herbs, maybe a little red onion, and use some vinegar and olive oil to dress it more like a savory salad, the melon takes on a whole new dimension. It's great with cucumbers, given a bit of an Asian treatment with rice vinegar, lime juice and zest, olive or avocado oil, sea salt, and fresh herbs like cilantro and mint. You could, alternatively, puree the melon and along with the usual vegetables, sherry vinegar, ground almonds, and olive oil, turn the cantaloupe into a memorable savory-sweet gazpacho. It's great along with other fruits and vegetables in a salsa to accompany summery grilled meats, and even steak fish like swordfish or tuna. And of course, cantaloupe is always a sweet ending to a summer meal. I sometimes serve the interesting combo of sliced cantaloupe with a salad of pitted cherries tossed with lemon juice, pistachios, and mint. Its unexpected flavor and textural combo gives a bit of a middle eastern lift to the final course of a meal. And it's refreshing. So whether you prefer sweet or savory preparations for your melon, the important thing is to consume as much of it as possible before cantaloupe season is over!